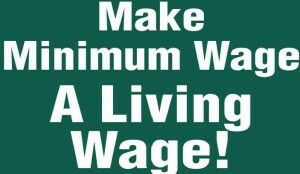 Make Minimum Wage a Living Wage! Yardsigns Now Available from the Workers’ Center! Will Send Anywhere! The Tompkins County Workers’ Center is in the midst of creating a Wave that demands that the Minimum Wage be increased to a Living Wage (which is presently defined in Tompkins County as $14.34/hour). The yardsigns are 16 by 26 inches in size. They are available from the Workers’ Center for a suggested donation of $5-$10 or whatever you can afford We want them up everywhere, so please do not let affordability get in the way of asking for one or more for free. Hi! Could I come pick up a sign from the TCWC office after the new year? Do you have any left?